In this article we aim to help and assist young drivers in the country of Spain obtain car insurance. Just getting a car insurance quote or policy is a struggle for young people as many insurance companies in Spain just do not want to take the risk. Young drivers are typically classed as being aged between 17 and 25. You really can’t blame the insurance companies because it is a statistical fact that these young drivers have the highest accident rate in comparison with older drivers. Young drivers in Spain have only recently passed their driving test and therefore are still gaining road experience. Younger people often lack maturity and will be so excited driving their first car that they will be tempted to show off in front of their friends and drive dangerously. Drivers under the age of 25 are more likely to drink and drive. How Much is Insurance for Drivers Under 25? We were approached by Angela, a young woman aged 23 years old who was struggling to find quotations for Spanish car insurance. To make matters even harder, Angela who lives in the town of Manilva on the Costa del Sol, is not Spanish but a British citizen living in Spain with a car which was also registered in the United Kingdom despite being kept and driven in Spain. Name, age and occupation of any name drivers: Jeannie Ropton, 54, housewife. Any previous claims or convictions: no. Where Can I Get Insurance for a Young Driver in Spain? Below you will see listed the nine different sources of insurance in Spain that we decided to contact to see if they would quote for Angela’s particular and unique circumstances as a young driver in Spain. Not only do we want to find out who insures under 25’s in Spain we want to find out how much it costs for young drivers to insure their car in Spain. 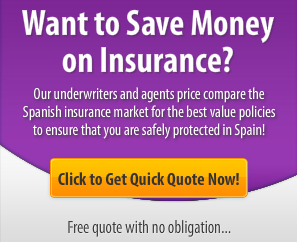 These sources are a mixture of the well-known insurance brokers and insurance companies which provide quotations for car insurance in Spain to see what quotations they could come up with for Angela. “First of all i need to confirm that the car is on UK plates. Second I need to know who is the owner of the vehicle. The answer above was badly written and contained slang and bad grammar. It has been corrected so it does not reflect on our website. The next response was from IBEX Spain who said they were unable to provide insurance themselves due to Angelas young age but they could through someone else try get a quote if she could provide the name of current insurer/policy number, registration number of the vehicle insured and her NIE or passport number. Hamilton were next to respond but unfortunately they can only insure people over the age of 30. Abbeygate Insurance were the next to respond but unfortunately they can only insure people over the age of 25. Insure in Spain (IIS) with the first company to actually give us a quotation for insuring a young driver albeit a very expensive one that this is explained below by Andy from Insure in Spain – IIS. A very slow response of a whole week before we finally heard back from Knight Insurance, who apologised for the delay but informing us that they are unable to insure young drivers in Spain driving a car on British license plates. So far we have never received a a response back from Expat Insurance in Spain, The Insurance Centre or Dragon Insurance. Incredible! Can Young Drivers Afford Insurance? Clearly, trying to get quotations and price comparisons for young drivers car insurance in Spain is a major difficulty and challenge. In our experience gender does not play a part – whether you are a young male driver looking for car insurance or you happen to be a young female driver as in our case study, it appears it is extremely difficult and very expensive to take out insurance under your own name. It seems many Spanish brokers and companies simply do not offer car insurance to people under the age of 25 or 30 regardless of circumstances. It also clearly does not help that we are trying to insure a vehicle registered in the United Kingdom for driving in Spain. It would seem that for many young drivers in Spain the most economical solution would be to get the car insured by someone else, for example your parents. In this way they can add you on to the policy as a named driver. Unfortunately the downside to this is that you will not build up what is known as a no claims bonus therefore whenever you need or wish to take out a policy in your own name it will always be extremely expensive to start with. To get the cheapest quote for full coverage car insurance in Spain try searching on the Internet for price comparison car insurance quotations as well as going directly to major insurers such as Linea Directa, Liberty Seguros, Mapfre or Caser Insurance. We also recommend contacting a number of Spanish car insurance brokers such as Knight Insurance Spain or Abbeygate Insurance Spain, although if you look in your local Spanish expat newspapers you will find many more advertisements listed.